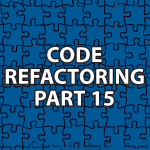 In this part of my code refactoring tutorial, we’ll look at how to replace a primitive type with a class. Type safety is very important! So, what we want to do is to eliminate all operations on values that are not of the appropriate data type by protecting the program from bad input. One way we can do this is by replacing primitive types with classes. I’ll walk you step-by-step through the process. The code below will help you along. // Type safety is very important. // the program from bad input. Do you happen to have an aspect oriented programming video tutorial? It would be great if you made that specific thing. Why not use Enums instead of creating a class as internally an enum is converted to a class and values in enum to objects? You could definitely do that. I was following a plan of refactoring this time in a different way.